Thanks folks for all the camera advice both here and on Facebook. I wound up with a Canon Powershot SD890 for just under $200. It’s so tiny! I like it a lot, and you all saved me much angst. I hate choosing things like this. So back to life on the backyard farm. 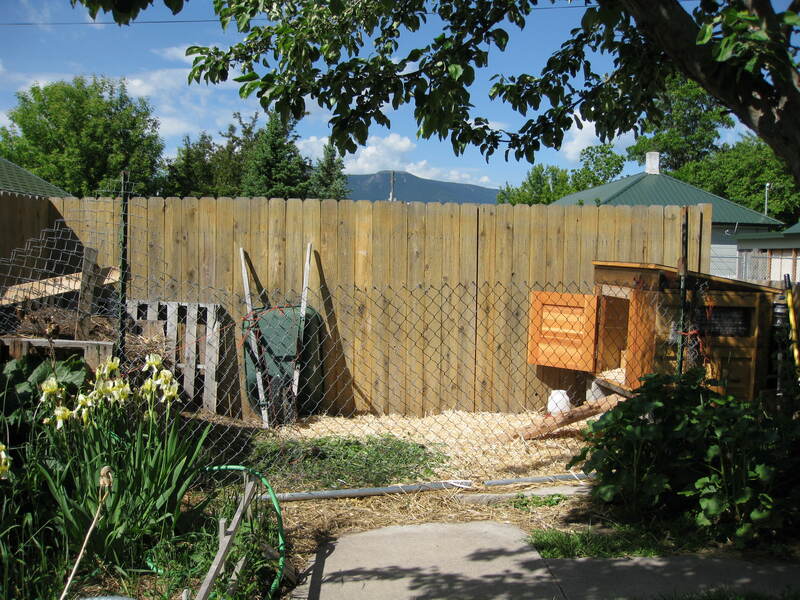 The chicken coop and enclosure wound up in the same corner of the yard as the compost heap, which is working out really well. They like taking dust baths in the more composted bin, and I’ve taken to throwing them buckets of weeds to let them pre-compost them. They like weeds, and they really liked the arugula I thinned the other day, and they seem to like lovage, which is good because that stuff will take over your herb bed. It was four feet tall! And growing — so I hacked it down and threw it to the chickens, who had a field day with it. Here’s the whole setup. 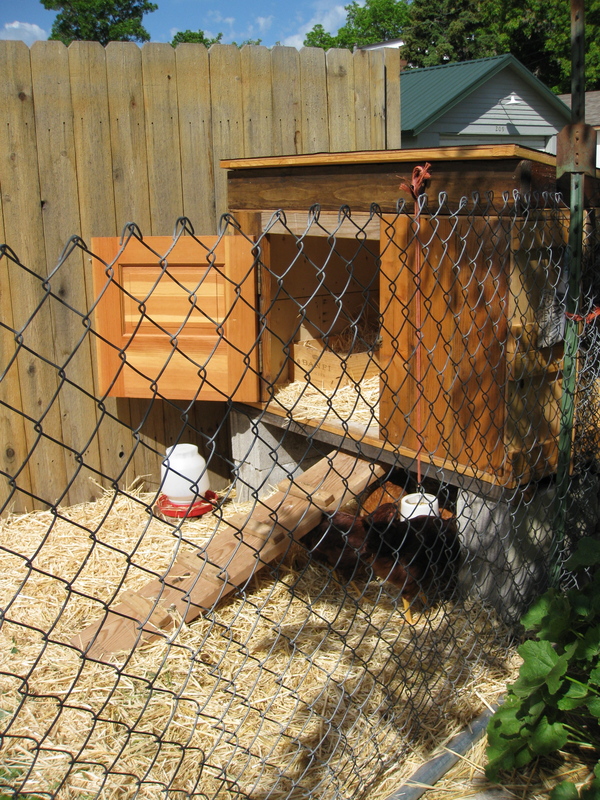 There was a vestigal concrete pad back there, so that’s where we decided to put the coop. Plus it’s sheltered from the street by the fence, and not too close to any of the neighbors. And there was the extra convenience of proximity to the compost piles — all I have to do when cleaning out is to scoop up the straw and dump it into the compost (in the wooden pallet composter on the left). 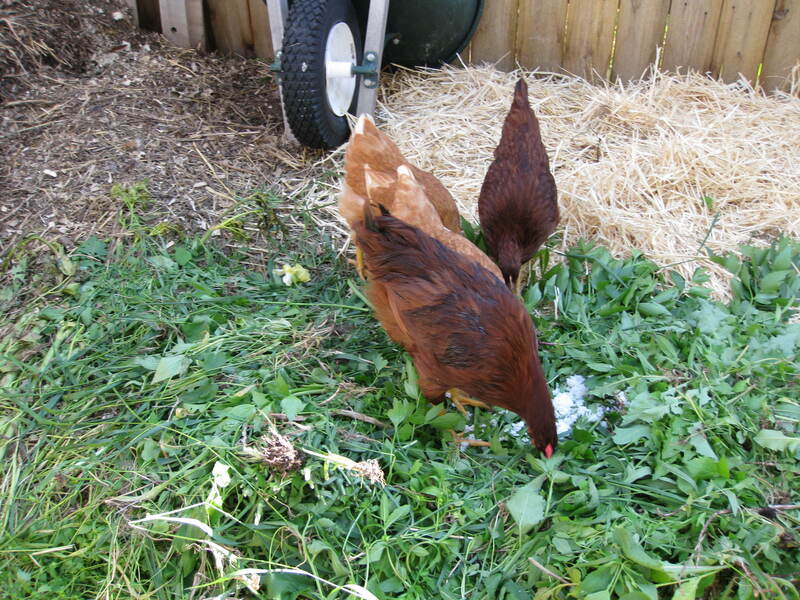 Turns out, the chickens love the compost. They take dust baths in the side that’s mostly dirt, and they climb up on the full bin to take a look around. 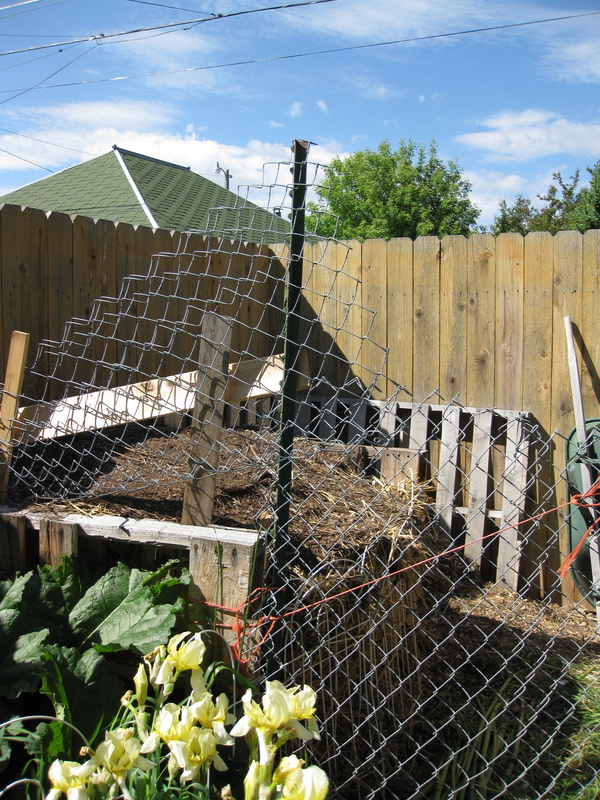 In fact, they were getting so bold up on top of the compost, that I had to add a little extra fencing. Classy, eh? There will be an official fence, eventually. We salvaged our friend Sabrina’s chain link fence that she replaced during her home renovation — there are posts, and a gate, but they’re currently in a heap under the apple tree. I’ve been promised a real fence by the 4th of July, but in the meantime, I rigged some fencing with a couple of stakes, the chain link, and baling twine. It’s a little “shenji” as my friends Bill and Maryanne would say, but I sort of like it, and it’s keeping the curious chickens from dropping down into the rhubarb where all sorts of hysterical chicken-and-dog interactions are likely to occur. I don’t think I’ve posted a picture of the actual coop itself. Chuck built it for me out of a packing crate (Sabrina had some paintings shipped over from England, and the crate was far too gorgeous to throw out). The door was from his stash, and you can’t really see it in this photo, but he put in a temperature-sensitive foundation grate for ventilation along one side. It opens when it’s hot, and closes when it’s cold. I used an old wine crate for a nesting box, and there’s a perch inside. They hang out underneath when it’s hot during the day. I’m a little worried about winter — I think it will be warm enough but they might need a window. However, we can figure that out when we get there. For now, they like their house a lot, and it only took them about two days to learn to roost up in the evening. No eggs yet, it’ll probably be another month before there’s eggs. And of course the rooster will probably have to ship out about then. He hasn’t started crowing yet, but he’s getting a little randy and seems to be chasing the hens around quite a bit. I’ll miss him, he’s got a funny personality, but I have no interest in hearing him at three am. So off to Isabelle’s he’ll go, poor boy, it’ll be quite a shock to be the smallest boy in the yard. Thanks for the update–always great to see what’s happening in your back yard!